Every so often a new range of Doctor Who inspired goodies comes along which gets you all excited and enthusiastic. Lakeland, long one of the best places to go if you wanted cookware or kitchen items, utensils and products which were a) different and b) actually worked, now has a large range of Who themed items available, all at pretty good and keen prices too. The lovely people there kindly sent me some of them to have a look at, and so here's some thoughts and comments on them! First off is a trio of items for baking and displaying cupcakes! What I really like about most Who merchandise is the care and thought that goes into the packaging - the bit that most people throw away! 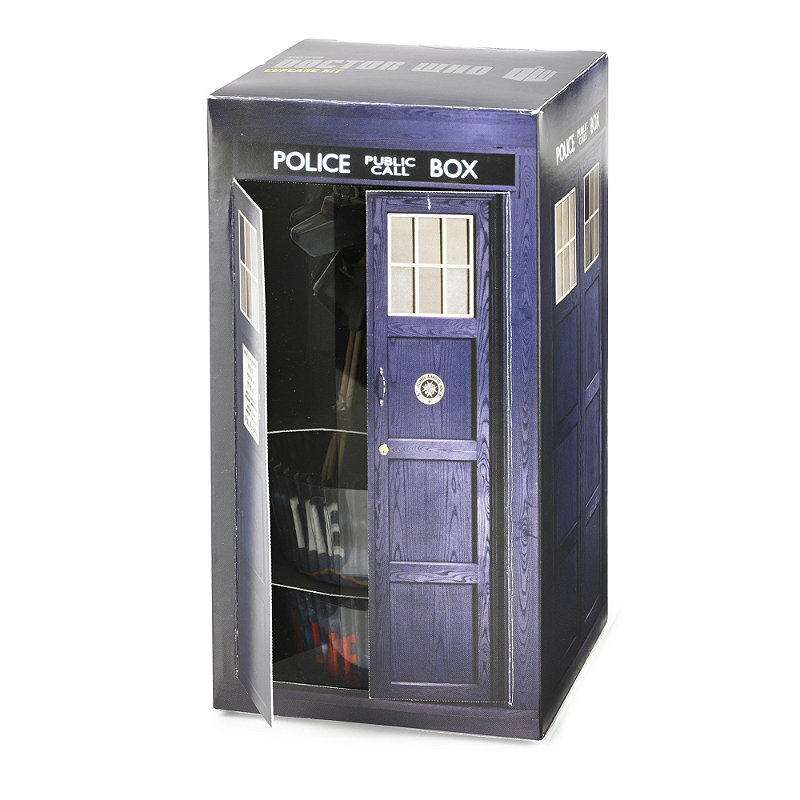 Thus with the Cupcake Kit, it comes in a nice little cardboard TARDIS ... but there's more. 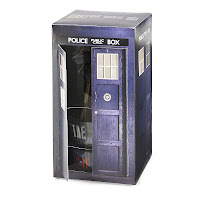 The TARDIS has opening doors which reveal the innards, protected by a clear sheet of plastic. 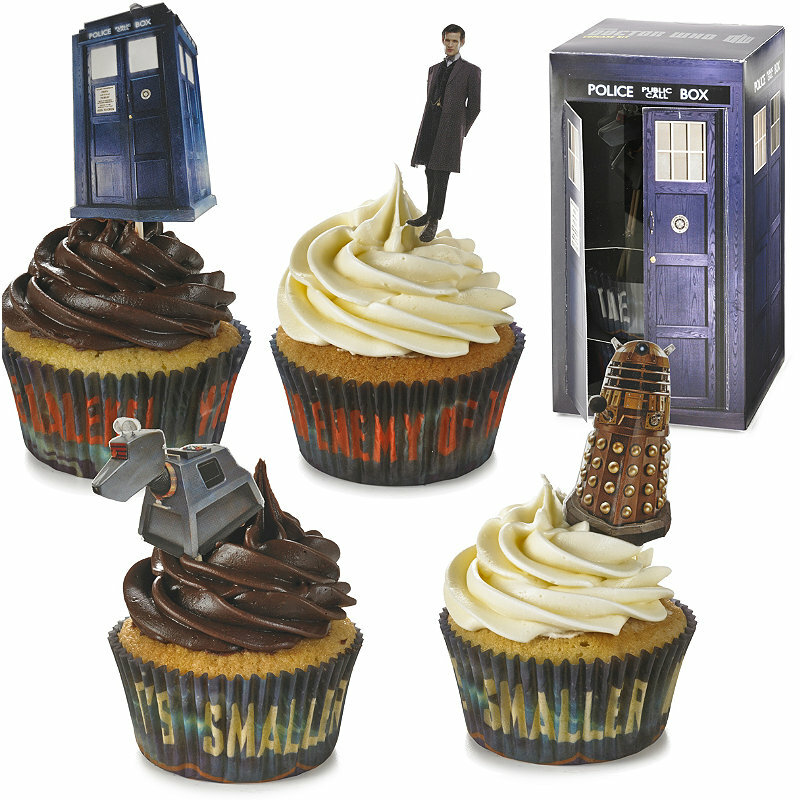 There are two sets of 12 cupcake baking cases: one with the words YOU ARE AN ENEMY OF THE DALEKS written around it, and the other with BIGGER ON THE INSIDE, These are held in a silver card inner which also has four sets of six items each little wooden sticks with cardboard cut out photographs on the top. There's K9, a Gold Dalek, the TARDIS and the eleventh Doctor. It's a shame that these are only one-sided, meaning that you can only see the image from one side only. The aforementioned silver card inner, also has very subtle images of the TARDIS printed on both sides. It's a lovely little set, put together with a lot of care and attention. 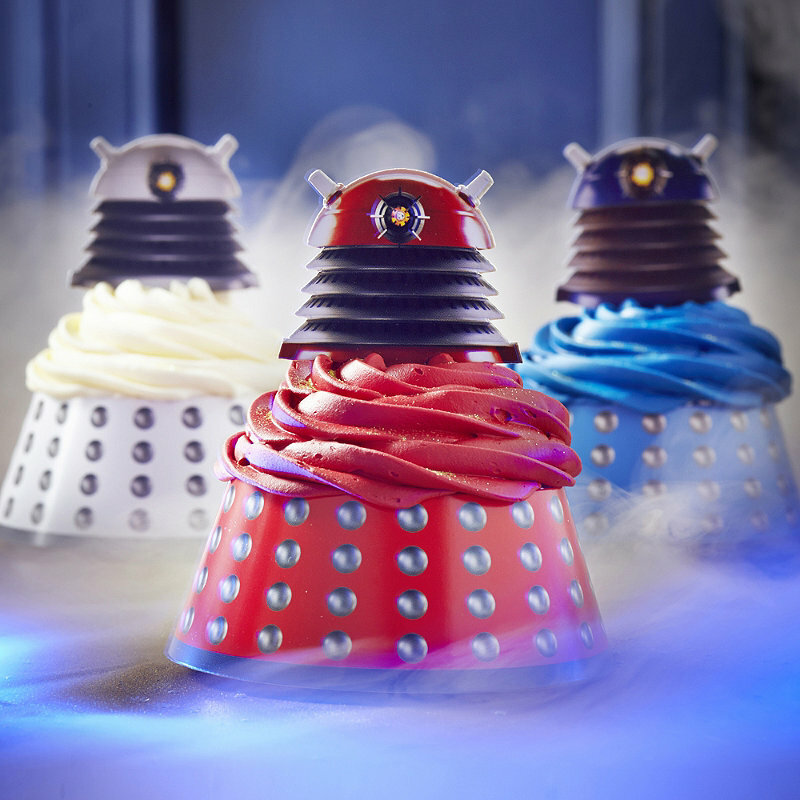 The other cupcake decoration set contains 24 cake wraps and 24 toppers - but these are Daleks! 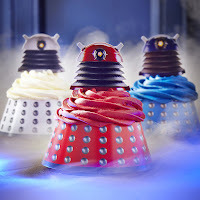 The pack contains wraps in differing colours for four of the new Paradym Daleks from the show: Red, Blue, White and Orange. The wrap is a simple card sleeve which sits around the base of the cake, and the topper is a 2-dimensional card image of a Dalek's 'head' which has a pointed card bottom and thus just sticks in the top of the cake. It's a shame perhaps that these weren't moulded from 3-d plastic, but from a single angle the cakes look pretty good. The packaging here is a simple flatpack containing the wraps and toppers. The photographic imagery is nice though. The final cupcake related piece is magnificent! 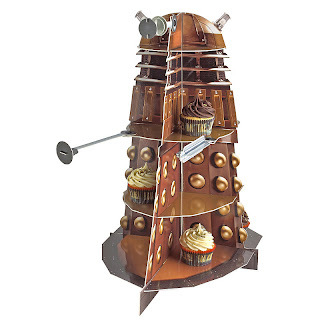 This is a large Dalek Cake Stand, which stands around a foot and a half tall! 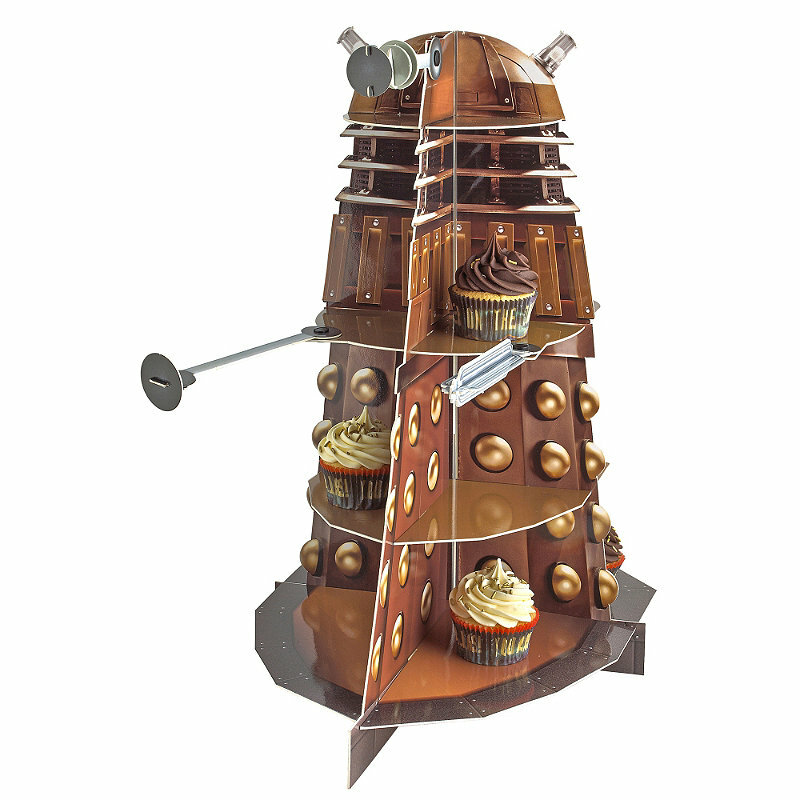 The pieces to assemble it come flatpacked, and in true Ikea style, you have to push the various elements together to create a 3-D Dalek stand, with three levels of surfaces on which to place your Doctor Who cupcakes! I guess it could also be used to display other things too, like little figures or models, or anything which fits! It is a 2-D, 3-D model though and so elements like the eyestalk, and gun/sucker arms are actually flat cardboard, but it does the job in suggesting a Dalek quite well. The eyestalk even moves up and down, and the arms are likewise pivoted to move from side to side. It's a wonderful idea, and is pretty well executed too. Great for a Who themed party! And a bargain at only £7.99! 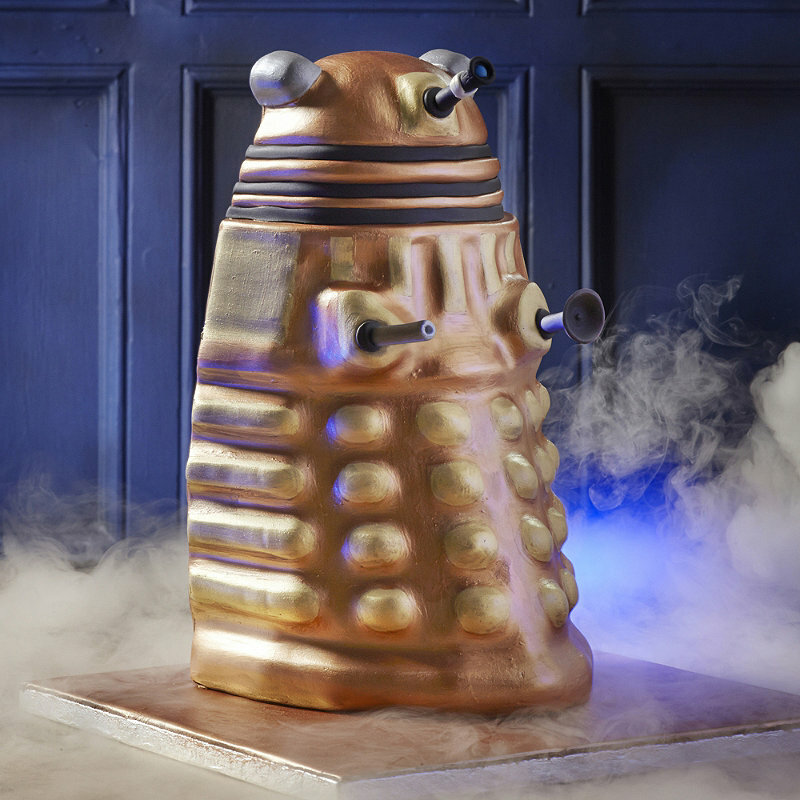 And if you're planning a party, you need a cake, and so Lakeland are to be congratulated on bringing out a proper Dalek cake mould! 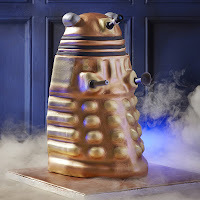 No more trying to construct a Dalek from swiss rolls and icing, this silicon cake mould will turn out a perfect Dalek shape every time (of course subject to cake mix and cooking temperatures and conditions!) It comes in a nice box with a die-cut Dalek shape in the front revealing the silicon mould in the box and images of a cake made from the very product. I'm not sure how the cake can be made so that the balls, slats and head pieces come out a different colour from the body mind ... maybe you have to be clever and use two different mixes or something? Or maybe it just happens by the way the cake bakes in the mould?